← Raindrops are like fairy whispers..
Η νύχτα στην όπερα είναι ηλεκτρισμένη. Δεν είναι περίεργο ότι οι εικαστικοί καλλιτέχνες εμπνέονται χρόνια τώρα από αυτές τις μεθυστικές μορφές τέχνης. A night at the opera is electric. It’s no wonder that visual artists have long been inspired by this most intoxicating of art forms. 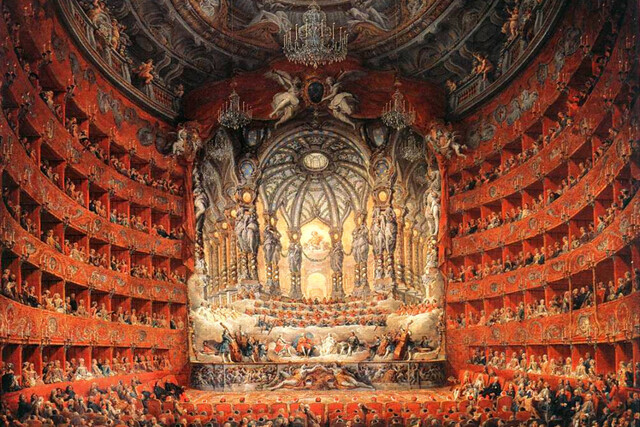 Some early artworks present a window into a world available only to a small handful of elite opera-goers; later works turn their attention from the stage and shine the spotlight on the audience and even use the architecture of opera houses as a canvas. 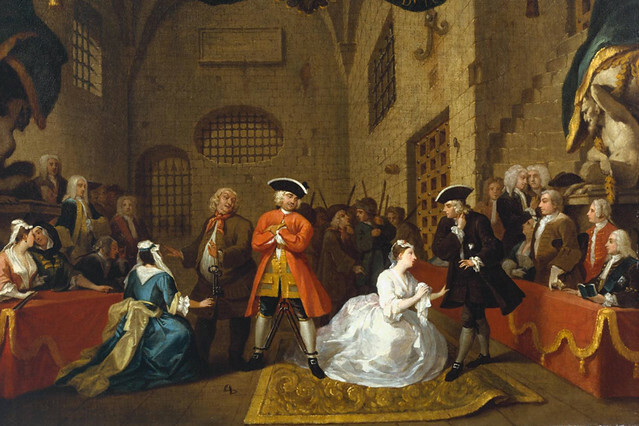 William Hogarth’s painting captures the climactic scene of John Gay’s ballad opera – the moment the highwayman Macheath is sentenced to death. The Beggar’s Opera had its premiere at Lincoln’s Inn Fields Theatre in London and went on to become his most popular work. It was later adapted by Bertolt Brecht and Kurt Weill and renamed as Die Dreigroschenopera (The Threepenny Opera) in 1928. Giovanni Paolo Panini was famous for decorating some of the best palaces in Rome. He was also a famous professor of perspective and optics at the French Academy in Rome, a skill evident in this magnificent rendering of the Teatro Argentina – one of Rome’s oldest theatres. French painter Louis Béroud was drawn to Paris to paint the city’s most famous buildings. 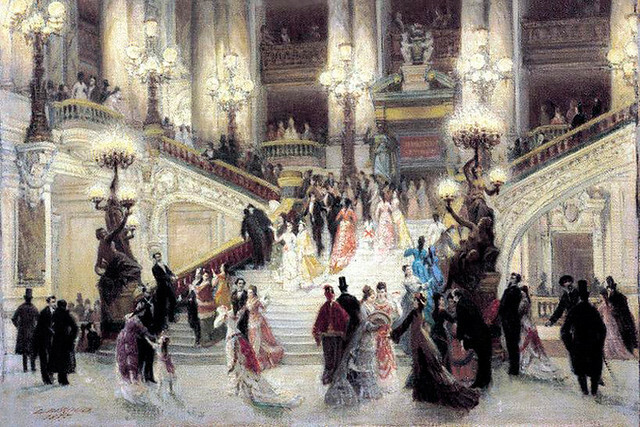 Here he captures the grand staircase of the Paris Opera‘s Palais Garnier. The building was reportedly designed to maximize the potential for people-watching, with stories of balconies and open staircases encouraging visitors to gaze up and down at their fellow audience members. ‘The Impressionists saw the theatre as a way of representing modern society in microcosm, in all its glory and trappings’ says Dr Karen Serres, Schroder Foundation Curator of Paintings at The Courtauld Gallery. ‘He was interested in the contrast between ballet dancers, most often drawn from lower social classes, and the high art they performed,’ observes Serres. 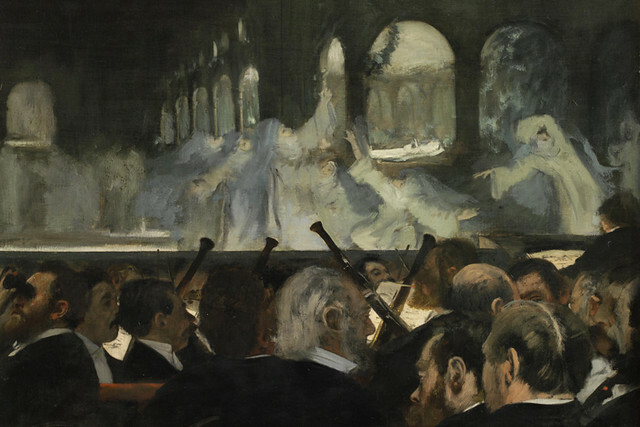 Degas painted dancers involved in opera as well as ballet, most notably in the provocative ‘Ballet of the Nuns’ scene from Act III of Giacomo Meyerbeer’s Robert le diable. The opera’s 1831 premiere starred the great ballerina Marie Taglioni with her contribution choreographed by her father Filippo Taglioni. 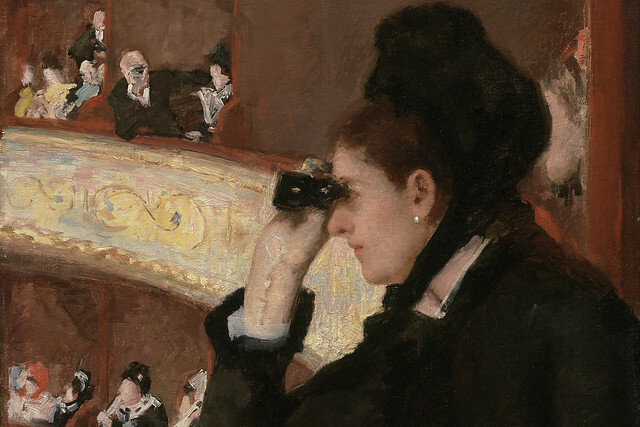 Spot the man peering over the box in Mary Cassatt’s Women in Black at the Opera, he’s not looking at the action on stage but the woman engrossed with the performance. ‘Here, the figures are not engaging with the performance because they are focused on the main activity of these evenings: to see and be seen,’ explains Serres. The relationship between the figures is quite ambiguous: are they a couple? Whether they are or not, they both seem to be aware of being under surveillance. 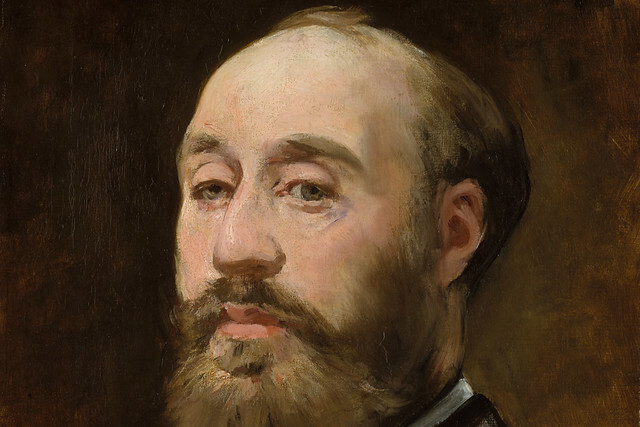 Édouard Manet’s portrait of French baritone Jean-Baptiste Faure (the first Posa in Verdi’s Don Carlos) captured him in the title role in Ambroise Thomas’s opera Hamlet – based on the Shakespeare play of the same name. The portrait was not received well when it was first shown at the Paris Salon in 1877. 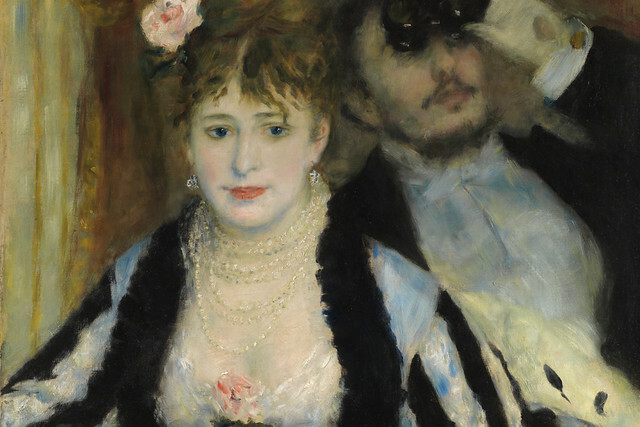 Faure, who was an avid art collector and owned many works by Manet, refused to accept this painting, feeling that the piece (which had taken many sittings) trivialized his triumph in the role and was insufficiently sophisticated in its style. 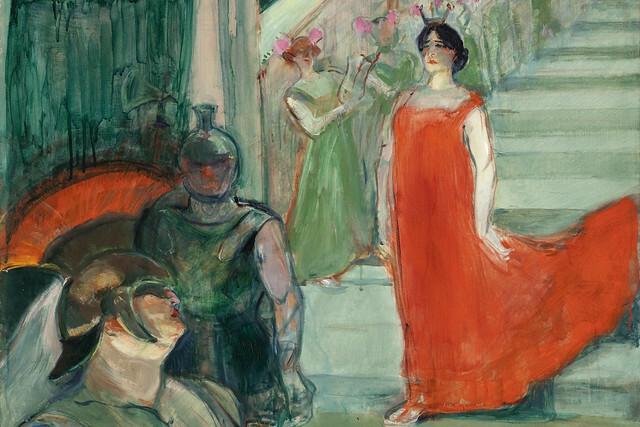 During a summer spent in Bordeaux, French painter Henri Toulouse-Lautrec would attend night after night at the opera, beguiled by the performers on stage. This piece captures a scene of British composer Isidore de Lara‘s Messaline (or Messalina) – a four act opera written about a Roman empress torn between her love for a poet and a gladiator, who happen to be brothers. John William Waterhouse embraced the Pre-Raphaelite style of painting despite the fact it had gone out of fashion several years before. The Pre-Raphaelites were painters and poets set on creating art in a less formal and ‘academic’ manner than Raphael and his admirers, and aiming to emulate the clarity, detail and complexity of early-Renaissance Italian art. 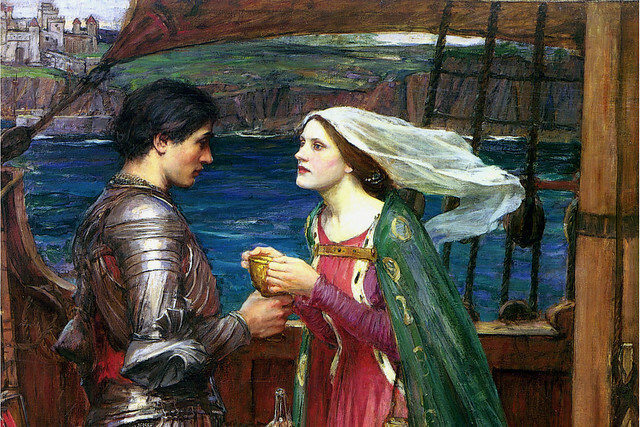 Waterhouse’s painting is inspired by the Celtic legend of Tristan and Iseult which follows the adulterous love between a Cornish Knight and an Irish Princess. Appearing in literature as early as the 12th century, the legend was was adapted numerous times over the centuries before composer Richard Wagner created the opera Tristan und Isolde. Waterhouse no doubt would have been familiar with Wagner’s masterpiece. 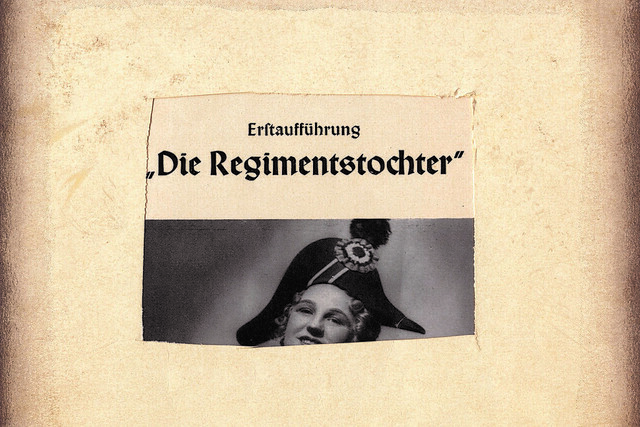 British visual artist Tacita Dean’s Die Regimentstochter remobilizes old opera programmes to assert their political and cultural importance. After scouring flea markets in Berlin, Dean presented 36 programmes from opera and theatre productions of the 1930s and 1940s where the city was the capital of Nazi Germany. Each programme has had sections cut from it, which gives the impression that a political stamp has been removed. ‘There’s a real political force to these careful cuttings and the multiple hidden layers they reveal,’ says Dr. Georgina Guy of Royal Holloway’s Department of Drama Theatre and Dance. The viewer is unsure whether the stamp removal occurred at the time of the performance, in the car journey home or during the artist’s creation of her work. 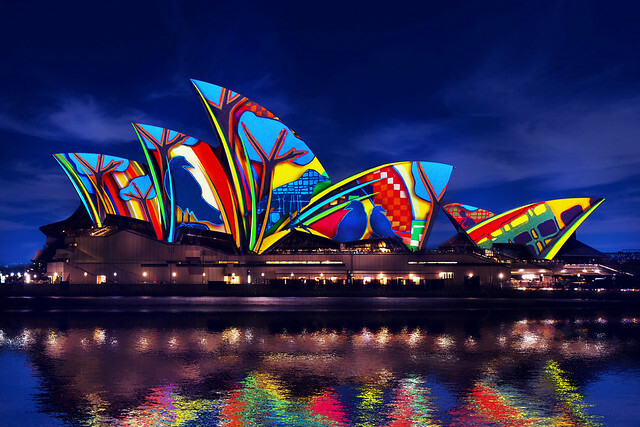 For the past eight years, Vivid LIGHT at Vivid Sydney has transformed the Sydney Opera House into a canvas for a spectacular light display. The white tiled sails of the building’s iconic roof are used as a projection space for animations. Thanks so much…I’m glad to hear your words. Really appreciate it. My pleasure Efi,you are spreading knowledge and I am one of the the seekers. I sincerely appreciate your comment!!! THANK YOU i am a seeker also…. nothing more!!! !